Official US Army Air Force Training Command photograph of 20 Tuskegee Airmen posing in front of a P-40. 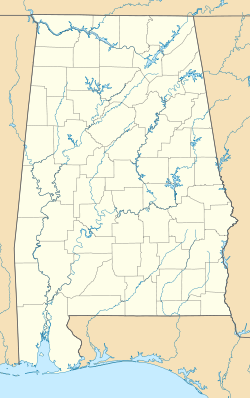 Sharpe Field (IATA: TGE, FAA LID: AL73) is a private use airport located six nautical miles (11 km) northwest of the central business district of Tuskegee, a city in Macon County, Alabama, United States. This airport is privately owned by the Bradbury Family Partnership. Formerly known as Tuskegee Army Airfield, Sharpe Field was used to train the Tuskegee Airmen during World War II. It provided advanced training for the graduates of nearby Moton Field. Most of the history of the Tuskegee Airmen was made at this site. The Air Field was designed by the African American architect Hilyard Robinson and built in 1941. Construction began on July 12, 1941. Training flights began in November of the same year, even though construction was nowhere near completion. A graded (but not yet paved) portion of the north/south runway was used to conduct initial flight training. On 23 July 1941 the Air Corps established an Air Corps Advanced Flying School to be activated at Tuskegee. Two weeks later, on 6 August, the Air Corps Advanced Flying School at Tuskegee was activated. It was later redesignated as the Tuskegee Advanced Flying School; the Army Air Forces Advanced Flying School; and the Army Air Forces Pilot School (Basic-Advanced). Tuskegee AAF was assigned to the Southeast Training Center of the Army Air Force Training Command. It was commanded by the 318th Army Air Force Base Unit. By the end of 1942, Tuskegee had a total of 3,414 personnel. Aircraft used at Tuskegee during World War II included the PT-17 biplane primary trainer, BT-13 monoplane basic trainer, AT-6 Texan advanced trainer, and P-40 Warhawk (used for fighter transition training). The first class of African-American aviation cadets entered the second phase of military flight training (Basic) at Tuskegee AAF on 8 November 1941, under military instructors. Only 7 of the 13 original cadets remained. The 99th Pursuit Squadron moved to Tuskegee from Maxwell Field, Alabama on 5 January 1942. The Air Base Detachment would later be redesignated as the 318th Air Base Squadron and still later as the 318th Base Headquarters and Air Base Squadron. Five of the aviation cadets at Tuskegee entered advanced flying training with P-40 Warhawks in January 1942. The 100th Pursuit Squadron was activated at Tuskegee on 19 February 1942. It was the second African-American Army Air Forces unit ever to be activated. The first class of African-American pilots at Tuskegee completed advanced pilot training on 7 March. There were only five who completed the training. On 17 April the Air Corps Advanced Flying School at Tuskegee Army Air Field was redesignated as Tuskegee Advanced Flying School. The second class of African-American pilots graduated from flying training on 29 April. By the end of 1942, nine classes of African-American pilots had completed training at Tuskeegee AAF. On 13 October 1942 the 332d Fighter Group was activated at Tuskegee, and the pre-existing 100th Fighter Squadron was assigned to it. The 301st and 302d Fighter Squadrons were also activated for the first time at Tuskegee, and assigned to the 332d Fighter Group. This group was the first African-American group in the Army Air Forces. On 23 March 1943, the group departed Tuskeegee for Selfridge Field, Michigan, where they received air combat training by First Air Force and eventually were deployed overseas for combat operations in Italy. Twin-engine training commenced at Tuskegee in 1943, at first using the AT-10. The 1944 US Army/Navy Directory of Airfields described Tuskegee AAF as having a 5,000' hard-surface runway As constructed during World War II, Tuskegee AAF consisted of 4 asphalt runways (the longest being 5,200'), taxiways, a ramp, and a large number of buildings north of the field. The AT-10 twin-engine trainer was replaced at Tuskegee by the TB-25 Mitchell in 1945. The last pilot class graduated at Tuskegee in 1946, bringing the total number of pilots trained at the base to 992. Tuskegee AAF was inactivated in 1946, and the property reverted to the town of Tuskegee. Many of the base's buildings were moved into the town, and 2 of the hangars were relocated. Although the 1962 Birmingham Sectional Chart depicted Sharpe Field as having 4 paved runways (with the longest being 5,000'), the Aerodromes table included the remark "North/South only usable runway." The Tuskegee airfield was evidently closed once again at some point between 1965–71, as it was not listed among active airfields in the 1971 Flight Guide. In 1976, an attempt was made to reuse the abandoned base as an oil refinery, but this did not work out. It was depicted as an abandoned airfield on the 1998 World Aeronautical Chart. The site of Tuskegee AAF was purchased by the Bradbury Family Partnership in the year 2000 time frame. It is strictly a private development, however, in 2003 that Sharpe Field was once again listed as an active private airfield. Only one runway was listed as being active, the 5,300' asphalt Runway 14/32. The owner was listed as the Bradbury Family Partnership, of Woodstock, GA. The purpose of the airfield having been reactivated is unknown, although the old ramp area was used as an asphalt plant for a number of years. Some of the equipment can still be seen on the ramp area. Sharpe Field covers an area of 2,600 acres (1,100 ha) at an elevation of 253 feet (77 m) above mean sea level. It has one asphalt paved runway designated 14/32 which measures 5,300 by 46 feet (1,615 x 14 m). ^ a b c FAA Airport Master Record for AL73 (Form 5010 PDF), effective 2009-07-02. ^ Freeman, Paul. "Tuskegee Army Airfield / Sharpe Field (AL73), Tuskegee, AL". Abandoned and Little-Known Airfields. Retrieved 25 September 2012. Wikimedia Commons has media related to Tuskegee Army Airfield. This page was last edited on 29 July 2018, at 00:33 (UTC).